John Storrow built his 7' long gaff catboat EMPRESS in his Boston apartment, completing her in September 2002. She was launched on October 20, 2002 in the Charles River in Boston. John uses a cart to transport Empress from his apartment to the river. 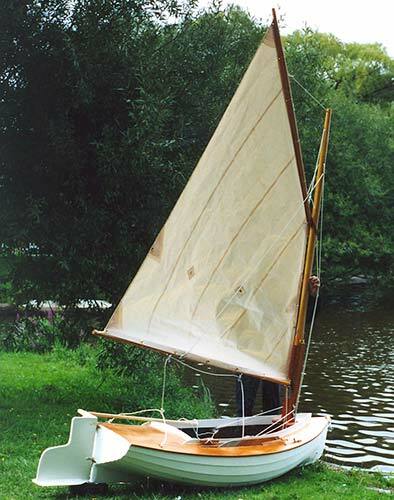 EMPRESS is Phil Bolger "Queen Mab" design gaff catboat (contact Phil at PO Box 120, Gloucester, MA 01930 ). She has a lapstrake hull constructed from glued plywood. John can be contacted at 73 Hemenway Street, Apt. 108, Boston, MA 02115.